Epidermal growth factor receptor (EGFR) inhibitor therapy has become the standard treatment for non-small cell lung cancer and head neck malignancy. 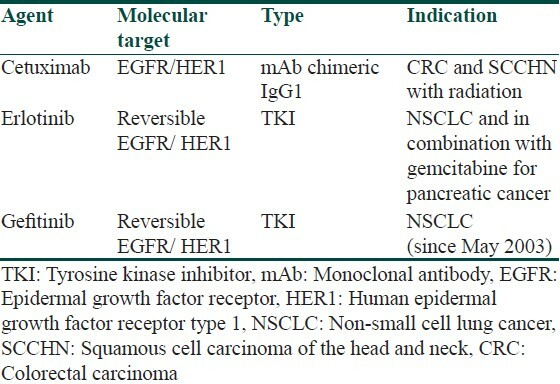 This class of drug comprises EGFR inhibitors (erlotinib and gefitinib) and monoclonal antibody (cetuximab). Use of this class of drugs has been associated frequently with dermatological side effects termed as PRIDE complex-Papulopustules and/ or paronychia, Regulatory abnormalities of hair growth, Itching, Dryness due to EGFR inhibitors. We hereby report the cutaneous side effects of EGFR inhibitor therapy in 15 patients of lung and head/neck cancer. The major clinical findings being acneiform eruption and severe xerosis of skin. Management of these dermatological adverse effects rarely requires discontinuation of targeted therapy and can be managed symptomatically. 1. There has been a rapid increase in use of targeted therapies in cancer treatment, which includes epidermal growth factor receptor inhibitors. 2. As compared to conventional chemotherapeutic agents, epidermal growth factor receptor inhibitors lacks systemic toxicity. Fifteen patients (14 males and 1 female) with a mean age of 53.8 years (range: 41-72 years) were being treated with either EGFR inhibitor or anti-EGFR monoclonal antibody for non-small cell lung cancer (n = 6), Ca. tonsil (n = 3), Ca. buccal mucosa (n = 4), Ca. posterior pharyngeal wall (n = 1), and Ca. pyriform fossa (n = 1). All the patients were referred to our outpatient department from a tertiary cancer hospital located in western India. [Table 1] gives the demographic data of the patients who were treated with the above drugs. All patients presented to us with the chief complaint of multiple red raised and pus-filled lesions on face, chest, back, shoulder blades, and nape of neck of varying duration of 10 days to 4 weeks. Few of the patients also complained of severe dryness of skin not attributable to seasonal variation along with pruritus. None of the patients complaining of acneiform lesion or dryness was being treated with drugs known to cause these problems, i.e., steroids or HMG CoA reductase inhibitors (Statins), respectively. Skin specimen of appropriate lesion was taken with the help of punch biopsy, fixed in 10% buffered neutral formalin, embedded in paraffin, and stained with hematoxylin and eosin. Cutaneous examination revealed multiple inflammatory acneiform eruption in the so-called seborrheic pattern. [Figure 1]a and b. Acneiform eruption comprised of multiple discrete erythematous papules and pustules on erythematous base on central chest. Gram smear examination of pustules revealed sterile inflammatory cells. Xerosis of extremities and trunk was seen along with scaling and excoriations [Figure 2]a and b. Two of the patients on cetuximab + paclitaxel (patient number 9 and 10) reported to have paronychia associated with pyogenic granuloma-like granulation tissue [Figure 3]. Routine investigations including complete hemogram, serum biochemistry, and urinalysis were within normal limits. 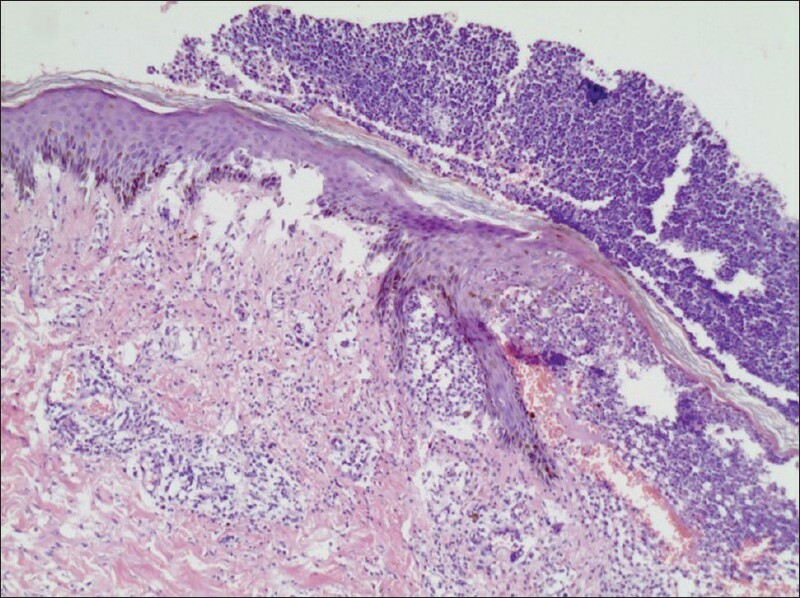 Hematoxylin and eosin stained sections of skin specimen showed mixed inflammatory infiltrate comprising neutrophils and lymphocytes around pilosebaceous unit [Figure 4]. All patients were given symptomatic treatment in the form of anti-acne lotions (benzoyl peroxide 2.5% wash and 1% clindamycin lotion) as was for inflammatory acne. Xerosis was treated with regular application of moisturizing creams and associated eczema was treated with mid-potent steroid cream (Mometasone furoate cream, 0.1%) and non-sedative anti-histaminics (nsAH) like levocetrizine 5-mg bid for a week. All patients showed good response to symptomatic treatment inspite of continuation of anti-EGFR drugs. Two patients with paronychia and granulation tissue in the nail fold were reassured about benign nature of the condition and were prescribed prophylactic steroid-antifungal lotion and gentamicin eye drops to be applied locally. The overall profile of these drugs has been summarised in [Table 2]. This class of drug has entirely different spectrum of adverse reaction consisting of an itchy acneiform papulopustular eruption, telangiectasia, and xerosis. The constellation of cutaneous side effects of EGFR inhibitors have been termed under the acronym 'PRIDE' (Papulopustules and/or paronychia, Regulatory abnormalities of hair growth, Itching, Dryness due to EGFR inhibitors). There have been cases of trichomegaly caused by use of EGFR inhibitor. , Our case series did not show any such hair growth abnormality. Acneiform eruption caused by EGFR inhibitors has been classiﬁed by National Cancer Institute Common Terminology Criteria for Adverse Events in 2006  [Table 3]. EGFR inhibitors have been shown to cause xerosis with associated asteotic eczema. 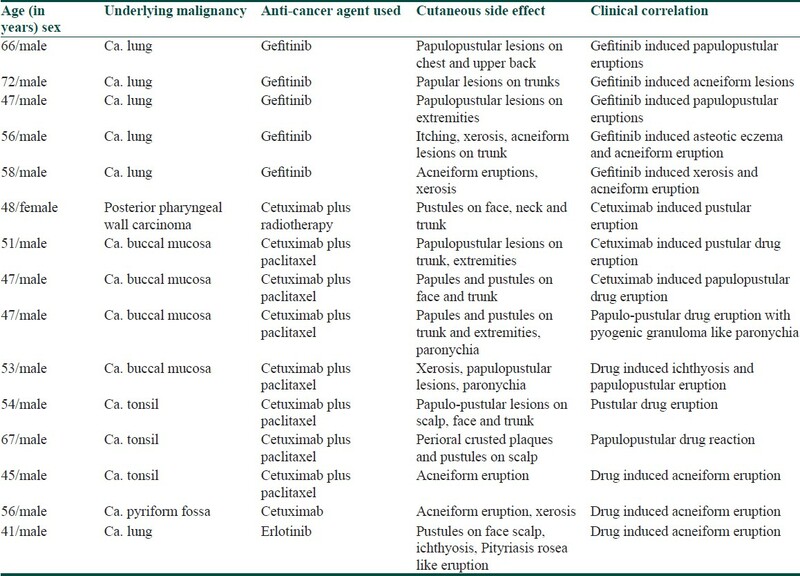 Older age of patients with malignancy can have an additive effect on dryness caused by this class of drugs. Epidermal growth factor is necessary for maintaining the epithelial barrier function. Accumulation of drug in the eccrine sweat units could lead to disturbance in their secretory function and thereby could explain the dryness of the skin. Severe xerosis with mucosal involvement can sometimes lead to sicca-like syndrome. Paronychia is another troublesome side effect, reflecting an aberrant vascular response affecting the nail folds. , Inflammation of proximal and lateral nail folds can cause redness, swelling, and sometimes exuberant granulation tissue formation mimicking pyogenic granuloma-like lesion. Toenail paronychia can sometimes be mistaken for onychocryptosis (ingrowing toenail). There is growing trend among cancer care physician to use retinoids as a lifelong treatment for chemoprevention of non-melanoma skin cancer. Oral retinoids may induce xerosis and paronychia, but not acneiform changes. Paclitaxel was used in combination with cetuximab in seven of our patients; however, no dermatological side effect could be attributed to paclitaxel use as per our observations. Knowledge of dermatological side effects of EGFR inhibitors will enable the dermatologist and primary care physician to tackle them more efficiently and will allow the medical oncologist to titrate the offending drug in case of severe cutaneous toxicities. In future, there are chances that many patients would be treated with these relatively safe anti-cancer drugs, and many such cases of skin reaction will come into light. Explaining the patients about the harmless nature of this troublesome skin reaction will restore their faith in the treatment and can ensure compliance. 1. Hu JC, Sadeghi P, Pinter-Brown LC, Yashar S, Chiu MW. Cutaneous side effects of epidermal growth factor receptor inhibitors: Clinical presentation, pathogenesis, and management. J Am Acad Dermatol 2007;56:317-26. 2. Baselga J. The EGFR as a target for anticancer therapy-focus on cetuximab. Eur J Cancer 2001;37(Suppl 4):16-22. 3. Rosell R, Moran T, Queralt C, Porta R, Cardenal F, Camps C, et al. Screening for epidermal growth factor receptor mutations in lung cancer. N Engl J Med 2009;361:958-67. 4. Busam KJ, Capodieci P, Motzer R, Kiehn T, Phelan D, Halpern AC. Cutaneous side-effects in cancer patients treated with the antiepidermal growth factor receptor antibody C225. Br J Dermatol 2001;144:1169-76. 5. Lacouture ME, Melosky BL. Cutaneous reactions to anticancer agents targeting the epidermal growth factor receptor: A dermatology-oncology perspective. Skin Therapy Lett 2007;12:1-5. 6. Lacouture ME. Mechanisms of cutaneous toxicities to EGFR inhibitors. Nature Rev Cancer 2006;6:803-12. 7. Lacouture ME, Lai SE. The PRIDE (Papulopustules and/or paronychia, regulatory abnormalities of hair growth, itching, dryness due to EGFR inhibitors) syndrome. Br J Dermatol 2006;155:852-4. 8. Dueland S, Sauer T, Lund-Johansen F, Ostenstad B, Tveit KM. Epidermal growth factor receptor inhibition induces trichomegaly. Acta Oncol 2003;42:345-6. 9. Pascual JC, Bañuls J, Belinchon I, Blanes M, Massuti B. Trichomegaly following treatment with geﬁtinib (ZD1839). Br J Dermatol 2004;151:1111-2. 10. Green MR, Couchman JR. Differences in human skin between the epidermal growth factor receptor distribution detected by EGF binding and monoclonal antibody recognition. J Invest Dermatol 1985;85:239-45. 11. Guy R, Kealey T. Modelling the infundibulum in acne. Dermatology 1998;196:32-7. 12. Harding J, Burtness B. Cetuximab: An epidermal growth factor receptor chimeric human-murine monoclonal antibody. Drugs Today (Barc) 2000;41:107-27. 13. National Cancer Institute. Common Terminology Criteria for Adverse Events v3.0. Available from: http://www.ctepcancer.gov/protocolDevelopment/electronic_applications/docs/ctcaev3.pdf. [Last accessed on 2011 February 12]. 14. Segaert S, Van Cutsem E. Clinical signs, pathophysiology and management of skin toxicity during therapy with epidermal growth factor receptor inhibitors. Ann Oncol 2005;16:1425-33. 15. Kimyai-Asadi A, Jih MH. Follicular toxic effects of chimeric antiepidermal growth factor receptor antibody cetuximab used to treat human solid tumors. Arch Dermatol 2002;138:129-31. 16. Boucher KW, Davidson K, Mirakhur B, Goldberg J, Heymann WR. Paronychia induced by cetuximab, an antiepidermal growth factor receptor antibody. J Am Acad Dermatol 2002;45:632-3. 17. Nakano J, Nakamura M. Paronychia induced by gefitinib, an epidermal growth factor receptor tyrosine kinase inhibitor. J Dermatol 2003;30:261-2. 18. Hardin J, Mydlarski PR. Systemic retinoids: Chemoprevention of skin cancer in transplant recipients. Skin Therapy Lett 2010;15:1-4. Papulopustular eruption is a marker of effectiveness of therapy with epidermal growth factor receptor inhibitor. 1. Histologically, papulopustular eruptions shows suppurative neutrophilic folliculitis and/or a perifollicular inflammatory infiltrate. 2. Adverse skin reaction due to EGFR inhibitor therapy can be handled conservatively and does not require cessation of cancer chemotherapy.